Pasta pie is an occasional treat that our boys always have fun making. I’d never heard of pasta pie until Michael and I started dating and he took me to the original Generous George’s in Alexandria, an institution known for its eye-popping colorful décor and filling pasta pies, which is simply a pizza pie topped with various creative pasta toppings. 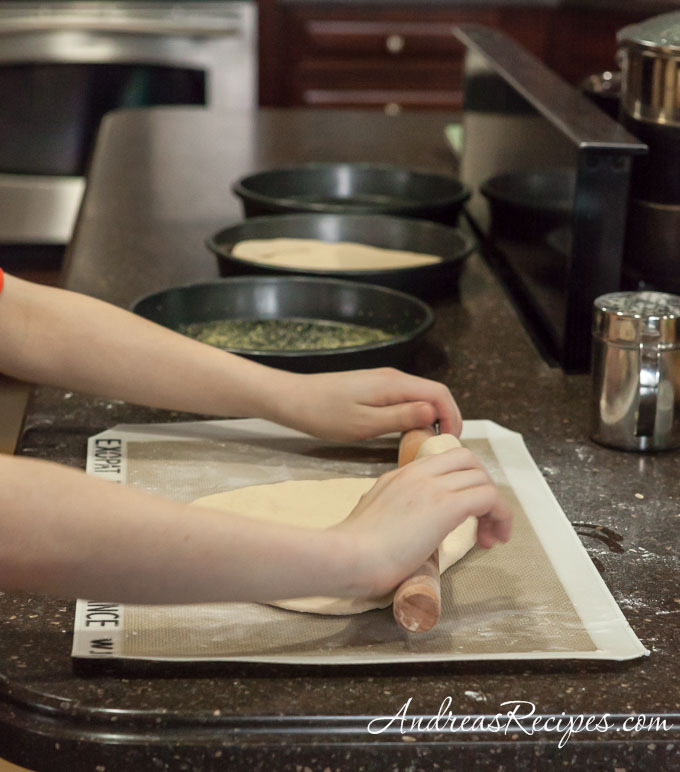 The Alexandria restaurant closed last year, a victim of the economy, but Michael is carrying on the tradition in our home making pasta pies with our boys. 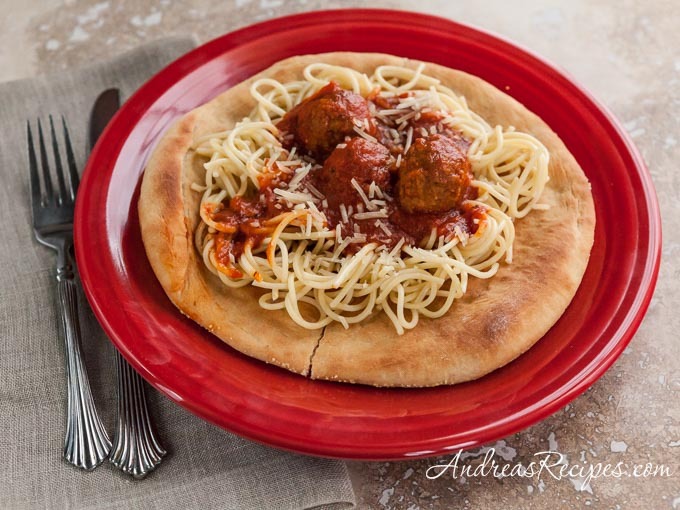 Their favorite topping is spaghetti and meatballs, but you can put any kind of pasta on top of a pasta pie. I say go for lots of vegetables, sneak some spinach in there, whatever you can get your kids to eat. Now for the pizza dough, use whatever recipe you prefer. We have several different recipes we use, including one from Artisan Pizza and Flatbread in Five Minutes a Day that we like. If you haven’t tried the Artisan Bread in Five method yet, I highly recommend it. 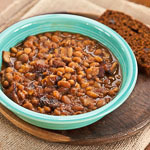 We’ve done it for several years, and it’s truly easy, you just need a a bucket with a lid and some space in your frig. If you prefer a more traditional method, the recipe below is how we make a part whole wheat pizza dough. 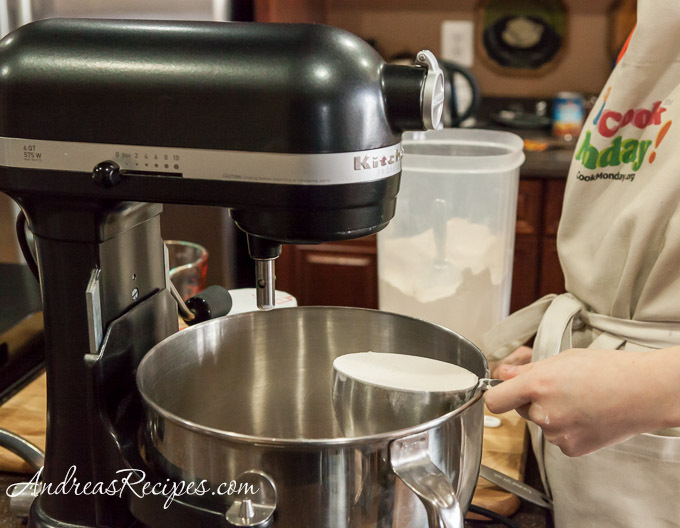 We use a stand mixer, but you can also do this completely by hand. 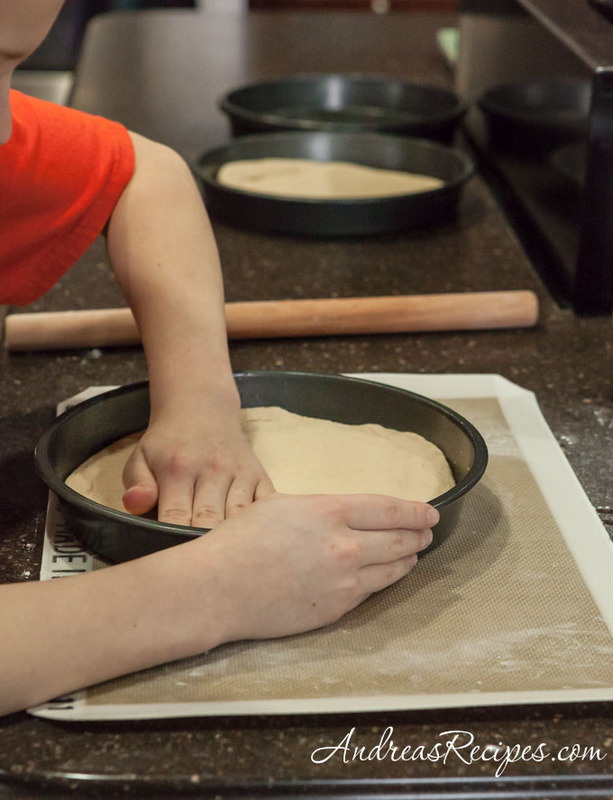 Here’s how to make the pizza dough, as demonstrated by Hockey Guy, 9 years old. Measure the flour, yeast, and salt and add to the mixing bowl. Make a well in the dry ingredients and add the honey, olive oil, and warm water. Stir well. Knead with the dough hook until the dough comes together in a ball. Use a spatula to scrape any flour and bits off the sides of the bowl as necessary. Then shape it into a ball and let it rise in another bowl. Roll each round of dough. Pat it into an 8-inch pan and bake, then top with your favorite pasta. Demonstrate and assist with any tasks that might be new: measuring, stirring, using a rolling pin. 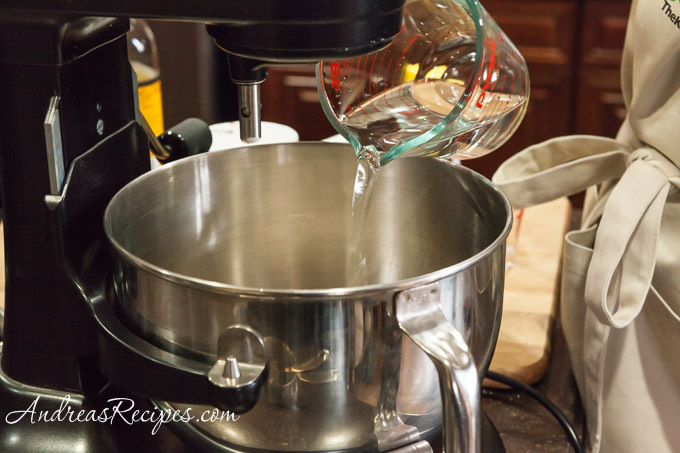 Make sure an adult is present at all times and supervises uses the stand mixer. 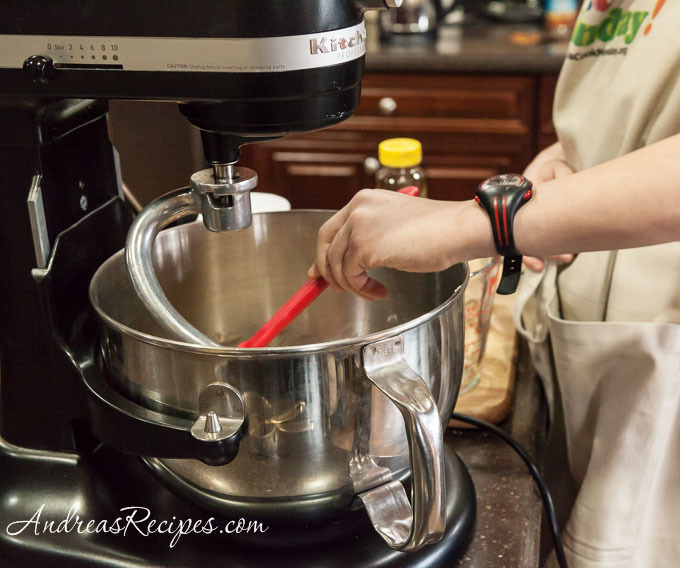 Teach children to keep hands out of the bowl when the stand mixer is running. Turn the dough out onto a floured surface and turn a couple times until it’s shaped like a ball. Spritz the large mixing bowl with olive oil and turn the ball of dough around in the bowl a couple times until it’s coated with olive oil. Cover the bowl with plastic wrap and set it in a warm place to rise until the dough doubles, about 90 minutes. Punch down the dough and divide it into 4 equal pieces. Shape each piece into a ball and roll into a round. Spritz each 8-inch cake pan with olive oil and sprinkle coarse corn meal in the bottom. Pat the pizza dough in the bottom of the pan, pressing it into the edges. Bake in the preheated oven until the pizzas are golden brown, about 8 to 10 minutes. 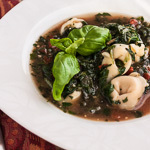 Remove from the pans immediately and cut in half or quarters, then top with your favorite pasta dish. I took one look at that pasta pie and I’m totally smitten. Hi T.W. They are fun, aren’t they? My boys get so excited when we say we’re going to make pasta pies. Generous George’s in Alexandria, VA serves their pasta on a pizza crust in lieu of giving you bread. I always loved the concept. That’s not what I expected to see when I read the headline! So cute and fun for kids! My girls will love this one. 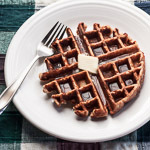 Keep all these yummy recipes coming!